WASHINGTON, DC -- A new bill in the U.S. Congress would prevent the White House from lifting a raft of sanctions against Russia until Ukraine restores control over Crimea, which Moscow forcibly annexed in 2014, or settles the peninsula's status to Kiev's satisfaction. 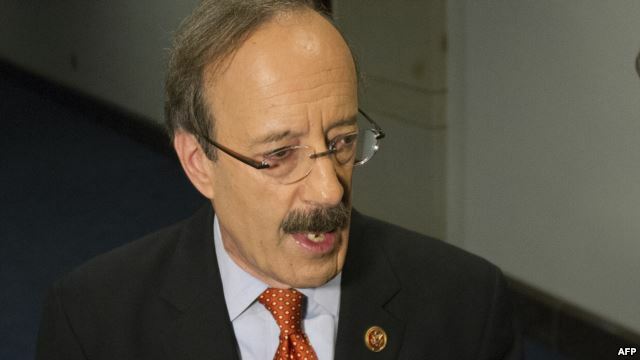 Democrat Congressman Eliot Engel (pictured) announced the new bill with Republican Adam Kinzinger. The legislation, announced on April 29 by U.S. Representatives Eliot Engel (Democrat-New York) and Adam Kinzinger (Republican-Illinois), aims to bolster U.S. support for Kiev with measures that include tightened sanctions against Russia and a push for greater private investment in the Ukrainian economy. "We need to build on our sanctions regime against troublemakers in the Kremlin, while working to preserve transatlantic unity," Engel, the top Democrat on the House Foreign Affairs Committee, said in a statement. "And we need to find ways of shoring up Ukraine and deterring [Russian President Vladimir] Putin that go beyond just throwing more money at the problem," Engel added. U.S. President Barack Obama's administration slapped several rounds of sanctions on senior Russian officials and companies following Moscow's military seizure of Crimea in March 2014 and an ensuing war between Russia-backed separatists and Kiev’s forces in eastern Ukraine. These measures and analogous ones taken by the EU have angered the Kremlin, which has said it moved to take control over Crimea due to fears for the people there after the ouster of Ukraine's Moscow-backed president, Viktor Yanukovich, amid protests that Russia has cast as a U.S.-backed coup. Russia also denies backing armed separatists in the conflict in eastern Ukraine that has killed more than 9,300 since April 2014, despite significant evidence of such support. The bill would require that the U.S. president, prior to lifting a raft of Ukraine-related sanctions, submit "certification" to Congress that Ukraine has restored "sovereignty" over Crimea or that the peninsula's status has been resolved to the satisfaction "of a democratically elected government" in Kiev. "As we have seen time and again, there is no stopping Vladimir Putin’s disrespect for global order, especially in regards to Ukraine," Kinzinger said. "It's time for the United States to stand up and reiterate that it will not tolerate Russia's aggression." Called the Stability And Democracy For Ukraine Act, the legislation was introduced in the House of Representatives on April 28 by Engel, Kinzinger, and 14 other co-sponsors. The legislation would also codify the U.S. government’s policy of nonrecognition of Russian authority over Crimea, mirroring Washington's policy of refusing to recognize Soviet sovereignty over the Baltic nations of Estonia, Latvia, and Lithuania. It also directs the U.S. administration "to consult with the government of Ukraine and seek to establish an international consortium to drive private investment in Ukraine by minimizing and pooling political risk to would-be private investors," Engel's office said in a statement.